Following an extensive 2007 trek across the Great White North, the White Stripes are set to release a new documentary about their Canadian adventure. While in Toronto over the weekend to play a last-minute show with the Dead Weather, Jack White leaked the plans for the yet-untitled film, explaining that it will be anything but run-of-the-mill. "It seems to be much more than a concert film," White told the Canadian Press. "I think Meg [White] and I gave away a lot more than we ever would have imagined we would want to." As fans may recall, the Detroit duo played every province and territory in Canada, doing spontaneous gigs at such places as on a Winnipeg bridge, in a Saskatoon bowling alley and at a youth drop-in centre in Edmonton during the 18-city trek. They also even ate caribou with Inuit elders in Iqaluit, did a kids-only show at a Toronto day camp and, went all Lonely Island style in Charlottetown, where they kicked out the jams from the back of a boat. "It just felt like such a vast, untapped place," said White. "As we went around and played a show in every province or territory, we realized that not even a Canadian band had ever done that. Which is wild, I can't even believe that. "How did we become the first, you know? It's already the 21st century!" From the sounds of things, the film will also shed a welcomed light on what has until now been a relatively guarded rock act. "When we started, we just didn't know what we were doing, so we just [said], 'Film everything, see what happens,'" White said. "I don't think we would wanna film ourselves like this. I'm pretty anti-reality television and all that ridiculous peeking behind the curtain sort of aspect of entertainment these days. "But in this case, I don't think it really has that ridiculousness to it. It does have an insight into some of the things that got created and how we went about making a tour like that happen." 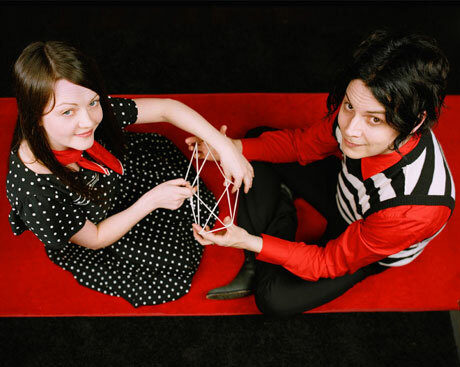 Along with spilling the goods on the new documentary, White confirmed to the Canadian Press that the White Stripes are indeed working on a new full-length, their first since 2007's Icky Thump. However, he did not reveal anything more than that.